An interesting figure found in the Book Cliffs of Utah that appears to be waving. This panel is located high up on the canyon wall and is on private property, so you cannot get up close without permission from the owners. This photo was taken from the road at 400mm and then cropped some more. I have seen this figure referred to as Barrier Canyon Style before, but I’m not so sure I would classify it as such? This section of the canyon contains many different styles of rock art in close proximity, including Ute and/or Paiute, Fremont and Barrier Canyon Style. It must have been an important place! 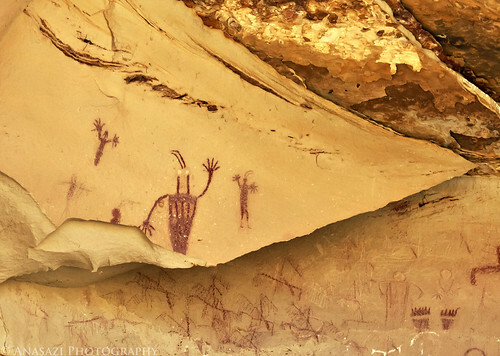 Below the waving figure there is a band of horseback riders that were most likely painted by the Ute or Paiute. The figures in this panel were created by wetting chunks of red ochre and drawing directly on the canyon wall.